As per NASSCOM, India is expected to generate revenue of $50 billion by 2020, while Davao City are expected to reach $27.4 billion by 2018. Asian countries have always been dominating the list of the leading outsourcing destinations for over 3 decades now. However, the main driving factor for this dominance is the availability of skilled resources, superior communication skills in multiple languages, and lower costs. Although India has been the top outsourcing destination for a long time, numerous other countries are now emerging as new alternatives and one of them is Davao City. Davao is the largest city in Davao City and has now emerged as one of the most preferred outsourcing destinations by global companies. Outsourcing to Davao City has helped many companies gain access to talented pool of resources, better infrastructure, and lower operational risks. The readiness of this city to ride the outsourcing wave is giving tough competition to some of the leading outsourcing destinations, including India. 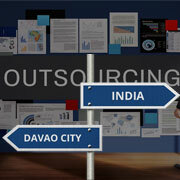 India or Davao City - Where Should You Outsource? Davao is an emerging outsourcing destination for organizations across the globe, predominantly for voice-based services. This is mainly due to its large native, English-speaking population of fresh graduates with an American accent. A combination of skilled voice-process executives and the cost advantage make Davao city a preferred choice for outsourcing voice processes. India, on the other hand, has been losing out on outsourcing of voice-based services due to the emergence of other Asian countries, which are also providing similar services. However, India has maintained its dominance in software development and other technologically demanding processes, as it boasts of a larger technologically updated and efficient workforce. Davao is doing great at providing customer support for companies from almost all industry domains. However, companies often look out for sales-based voice support services, which are more than mere customer support. Only few companies in Davao are moving towards providing their customers with such sales-based services. India is well-equipped to provide clients across the world with efficient and reliable voice-based as well as sales-based services. Many global companies have shifted their operations to India, considering its capability to provide industry-best sales-based call center services using integrated technology-based platforms. With automation reducing labor count, BPO services are now sourced from the cloud. Davao City with its quickly improving infrastructure is now successfully providing BPaaS to global clients. India is already a well-established BPaaS providing destination, which has a dedicated undersea cable network, employs cloud-computing based service models, and has technical expertise to deliver quick and reliable BPaaS. e-commerce support services come with a specific set of outsourcing requirements, other than customer support. These include product information management, product catalog management, etc. Davao City, with its main focus on voice-based services, is yet to emerge as a complete e-commerce solutions providing destination. India, on the other hand, is a primary destination offering top-quality e-commerce support services to businesses around the world. BPaaS Companies who outsource to India not only have a strong customer support base here, but also take the advantage of advanced software tools, technological expertise, as well as storage and logistics facilities that are available here. The service providers in Davao are well supported by the outsourcing-friendly initiatives and facilities provided by the Philippines government. The government here is keen on building better infrastructure that support outsourcing boom in Davao and other major cities of Philippines for future expansion. Being in the outsourcing industry for over 3 decades now, India has a developed and well-established infrastructure, which can support different types of services from global clients irrespective of the volume. Indian outsourcing companies are known for providing accurate and reliable services within a quick turnaround time. Infrastructure and Skilled Manpower - Although Davao City is on the list of preferred outsourcing destinations of many companies across the globe, it still lacks the best-quality infrastructure and skilled manpower. On the contrary, India has world-class infrastructure as well as skilled and efficient resources. Advanced Technology - Davao City is yet to acquire the expertise to leverage latest technologies, which are required to provide technologically demanding services, such as software development, engineering services, healthcare BPO, creative design, etc. Superior Voice Support - Call centers in Davao city are equipped with skilled resources trained to handle global customers speaking in multiple languages, making it a perfect outsourcing hub. However, outsourcing to India ensures competent sales-based voice support services, as call centers in India are integrated with technology-based platforms. Read an article to know more about India's Hot & Happening Outsourcing Destinations that offer unmatched business benefits to global outsourcing companies. 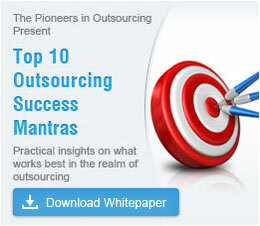 Outsource2india has been providing world-class outsourcing services to global clients for over 20 years now. Having multiple delivery centers across the globe including India and Philippines, we can instantly help you to get started with your outsourcing projects in any of these nations. We will also help you to quickly migrate your operations from other locations and set it up in India or Davao city with our efficient transition process. Our vast multi-domain experience helps us to precisely cater to the outsourcing needs of global clients from different backgrounds and cultures. By partnering with us, you can be assured of industry-best infrastructure, complete data security, quick turnaround time, and cost-effective rates. If you want to minimize your operational costs without compromising on the quality of the services availed, then please feel free to reach us now to discuss your outsourcing needs.